This morning The Terminal sent an email to Jim Bakken, director of media relations at the University of Alabama at Birmingham (UAB), requesting a breakdown of revenue sources at the school for the last 3-5 years. We were specifically asking for those numbers to be broken down between research and non-research sources. It is our contention that the original decision to announce the discontinuation of UAB’s bowling, rifle, and football teams would be understood in a much broader context once folks take a closer look at that data. We’ve since found other ways to make our case. The key to this approach to the story is taking a step back and looking at the entire university and not just athletics and its budget in a vacuum. Many of the arguments associated with saving the program are based on proving UAB can afford to pay for athletics. If you base it purely on cash in hand and access to the money in the budget, this is a true statement — the school can afford to field a full slate of teams. If you remember it is one department in one of the state’s most valuable resources — and one that recently hasn’t been able to provide for merit raises, etc. — you realize it becomes a flimsy proposition quickly. A look at the 2013 financial report (particularly pages 5 and 6 for purposes of our initial statement of facts) gives us the first lovely graphic accompanying this article. It shows the appropriations received by UAB from the state of Alabama from 2009 – 2013. It essentially suggests that appropriations have remained flat for that time frame. The findings reported by Yellowhammer News back in September shows that the total decline has been slow, but steady — a result of the recognition of UAB’s importance to the state economy. The decline for UAB (5%) incidentally is not nearly as precipitous as the ones for the main campus in Tuscaloosa (20.7%) and Huntsville (19.2%) during that same 1987-2012 time period they referenced. This will come into play at the end of this piece. A look back at this piece filed by former Birmingham News reporter Hannah Wolfson in September 2011 shows that the budgets for all three schools in the university system rely heavily on increasing enrollment numbers. Officials have tried very hard to resist raising student fees and tuition, even though that’s the only non-research related funding potentially under the school’s control. It’s what allows them to pay for non-hospital and non-research faculty related positions. It also allows for the subsidy for athletics. 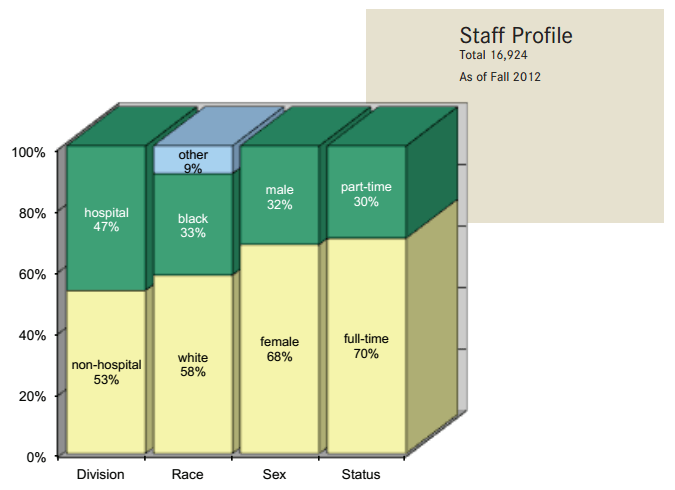 Basically, non-research related funding is what’s used to pay for most of the non-hospital positions at UAB. That would be the reason for the use of the second graphic taken from the report in this piece. The inability to see significant increases in funding means you can’t afford cost of living increases, non-capital efforts, or (as evidenced on Tuesday) pay raises for coaches in athletics if the program is being propped up via a subsidy from the academic side. Research funds can’t necessarily be used because they’re basically earmarked for specific projects. One thing to remember as you look at when this article was filed is what else was going on at the time — the UAB on-campus stadium effort. It provides the basis for another theory as to why it was never taken up by the Board of Trustees for consideration two months later. Following this to its logical conclusion, it can be hypothesized that Ray Watts didn’t cut football because he was out to hurt UAB; he cut football to keep UAB from suffering a fate similar to the current situation at the University of Maryland – a hiring freeze for all non-research related positions. It would also explain not only why Carol Garrison resigned before but why Judy Bonner announced her resignation late last year at Alabama. It also explains why the university has been so excited with regard to its recent increases in research funding, specifically from the National Institutes of Health. Incidentally, Maryland did just announce this brand new project — one that won’t be affected by their hiring freeze. This is after they made a move back in 2012 that may look familiar to those who’ve been following the UAB situation — except they chose to keep football. There are other effects to this effort — ones we’re continuing to investigate at this time. Last week the Birmingham Business Journal referenced a 2008 paper published by the Ohio State University focusing on the issue of no confidence votes. Its author, Sean McKinniss, still maintains a database of known votes that have taken place across the country. A review of the data from earlier this month showed at least fourteen (14) such votes were taken during 2014. (NOTE: there are now at least twenty (20) entries for the previous calendar year.) While many of those votes led to eventual resignations, some — like one held in September to voice concerns about University of West Florida president Judy Bense — led to the board of trustees passing a resolution to continues to serve in the position. Watts has said he has no intention to resign from his post — even if both the student government association and the UAB Faculty Senate pass their proposed resolutions. Reports suggest the faculty senate could approve their no-confidence vote during Thursday’s meeting. It is set to host a bi-monthly Q & A session with Watts as part of its regularly scheduled meeting tomorrow. NOTE: The Terminal has been (mostly) quiet as I, André Natta, prepare to make a presentation to the Alabama chapter of the Public Relations Society of America on Tuesday, January 13, 2015. (Here’s the link with all of the information about the talk.) Preparing for the talk meant doing a completely separate, independent review of all the facts — those everyone is aware of and those folks aren’t quite paying attention to yet. Much of that research hinges on digging deeper into the Carr Report — a document (now 58 pages) that has been cited by UAB president Ray Watts as a key tool in reaching the decision. This is the first of the reports resulting from that research. The detailed version of the Carr Report also fails to take into consideration the fact that all of Conference USA’s current television contracts are set to expire at the end of the 2015-16 academic year. (That would be on page 22, a.k.a. Exhibit 1, Page 5.) Yes, they did just sign a contract with the American Sports Network in July – for two years, meaning it will expire at the same time. C-USA has been attempting to raise its profile in recent months, with pieces such as this incredible one published on SBNation about the first ever Popeyes Bahamas Bowl on Christmas Eve. They also paid for a PR consultant to help raise Marshall’s profile in advance of bowl game selections. The loss of UAB football is potentially a major one insofar as leverage in contract negotiations for television networks. It seems as though we’re football crazy in metro Birmingham – the market has just been named number 1 for college football for the fourteenth year in a row with a 9.2 rating. Add that to the performance of this year’s team – arguably playing what turned out to be the most challenging schedule in its conference this year – and you realize when the number 2 TV market in the country is down at 5.2, it’s a major issue. Even if it were to go a more digital route, like the Mountain West (the one C-USA almost merged with a couple of years ago) has done in partnership with Campus Insiders, it would lead to less money that what is currently shown in the Carr Report. Efforts to get the conference office to provide comment about the status of television contract negotiations have been unsuccessful so far. Any reply will be added to this story as an update. Googling the name of the author of the Vice Sports report would let you know he is currently working as a consultant for the plaintiffs involved in the O’Bannon vs. NCAA lawsuit — the one still working its way through the legal system. His analysis assumes the university does not have to pay the room and board costs associated with housing the athletes as part of the new NCAA Division I governance rules. They may not have to “pay,” but there is still a “cost” that must be undertaken by the university to provide this amenity. Not paying the cost means a wider deficit to be filled with a growing subsidy from the academic side. There is also a cost to providing guaranteed scholarships for their entire academic career, including the cost of paying for former student athletes to complete their degree if they choose to return after leaving to pursue a career as a professional athlete. The projected health care costs given the industry’s current fluctuations suggests they may be conservative. Needless to say, it’s an optimistic stance taken in the document. It’s also showing some revenue as non-existent – including ticket sales at Regions Field during baseball season. Ohio State is playing in town the last week of February for a non-conference series against the Blazers; it alone invites the opportunity to increase revenue. Something else to be considered is the cost of the indoor practice facility in relation to other conference schools. The one most often mentioned recently is Florida Atlantic University. Lost in the excitement surrounding the announcement by Dr. Watts on December 2 was one by FAU – that of the largest single donation in the school’s history of $16 million (actually matching one made several years earlier) to help jump start fundraising efforts for a $44 million, 185,000 square feet athletic facility. Yes, $44 million to build a facility that will be primarily used not only by their football squad, but by the 20 other teams fielded by the school located in Boca Raton, Florida. All of the reports associated with the $10 million indoor practice facility suggests it would only be for the football team. There are other issues to be raised, and they will be shared after the case study presentation tomorrow afternoon. Construction continued Friday morning on a new gateway sign for the University of Alabama at Birmingham to welcome those travelling westbound along University Boulevard at Richard Arrington, Jr. Boulevard — a sign of things moving forward. This was as some attempted to determine next steps following Tuesday’s announcement by university president Ray Watts that discontinued the football, bowling, and rifle teams. One becoming more apparent involves the upcoming regularly scheduled meeting of the UAB Faculty Senate on December 9. It will be held on campus at the Finley Conference Center in the Kaul Genetics Building the 1st floor auditorium in Cudworth Bldg, (1919 University Blvd. ), from 7:30 – 9:30 a.m.
A review of their landing page on the university’s website states Tuesday’s agenda includes the item “UAB Athletics and Athletic Team Support.” This is believed to be representative of a proposed resolution asking that the three affected teams be reinstated immediately. There have also been calls online for the senate to conduct a vote of no confidence, most notably in the form of a letter signed by members of the UAB School of Nursing and obtained by several news outlets on Friday afternoon, including AL.com. During this evening’s rally on the university’s campus green, it was announced students planned to be in attendance at Tuesday’s meeting to also request the no confidence vote. Other planned demonstrations over the weekend include a mass march scheduled for 11 a.m. (there is no word if it would be canceled if it is raining as is currently predicted) and a “white-out” for Sunday afternoon’s men’s basketball game against Illinois State at Bartow Arena. Today’s developments followed Thursday night’s “black-out” of the men’s basketball team’s 58-48 victory at home against Morehead State. The football team took to the court during halftime to a standing ovation; the students rushed it after the game. It also followed a statement of support for both UAB and its president Ray Watts from the Birmingham Business Alliance’s executive committee and more pieces published nationally about the situation — including this one from FiveThirtyEight. As we watched events unfold alongside students on Tuesday, much of the focus on UAB president Ray Watts’s announcement about the discontinuation of the football, bowling, and rifle teams has focused on UAB being the first NCAA Football Bowl Subdivision (FBS) school to do so since 1995. It’s important, but it’s necessary to look at the bigger picture in Division I in order to see a larger trend and to find a possible solution. A review of a list of discontinued football programs shows that UAB is the sixteenth Division I school overall to make the choice in that time period. The majority of those schools compete in the Football Championship Subdivision (FCS) with 10 out of 16 located in the Northeast — the place where football was born; three other schools are located in California (including the largest of them, Cal State Northridge with more than 38,000 currently enrolled). It may not seem like it makes sense to talk about the FCS schools until you realize the most recent example of a relaunched program comes from those ranks — East Tennessee State University. As you can see above, the program did close in 2003, but is scheduled for a return next fall. The full explanation is included as part of an editorial over on Dear Birmingham. Another angle that has received significant attention these last two days is the potential fate of Legion Field. The Football Capital of the South. Realize if all options are on the table, there are two things that need to be remembered. Legion Field is McLendon Park — the football stadium is located within the largest piece of property dedicated to park use in the city of Birmingham. (Yes, Red Mountain Park is huge, but it’s technically overseen by a state commission; Ruffner Mountain Nature Preserve is as its name change states, a preserve, and its managed by a non-profit organization.) If (as unlikely as it should be) considered options include demolition, file away the fact that it means we could see the land transformed into the city’s largest park. This could be seen as a catalytic project for the surrounding blocks. Non-park use requires a public vote — Yes, it’s true. The property is dedicated for purposes related to parks and recreation. According to the city code, if it is to be used for any other purpose, a public referendum will need to be held and it pass in order for that new type of solution to move forward. The called meeting of the city’s Parks and Recreation board to discuss possible options is currently scheduled for next Monday. FYI — it’s included at the end of this piece, but there is a march planned for Monday morning, December 1, at 9 a.m. to the UAB administration building. They are planning to gather on the Campus Green located between University Boulevard and 10th Avenue South and 14 and 16th Streets South) at 8:30 a.m. Whether you want to #freeUAB, #respectUAB, #saveUABfootball or #saveUAB, the spontaneous rally held on the university’s Campus Green on Sunday evening, November 30, — after several media outlets reported of the program’s pending demise — presents the latest chapter in the attempt to save UAB’s football team. The UAB men’s soccer team were rewarded for their 11-7-1 record and No. 21 national coaches’ poll ranking by receiving their third bid in four years to the NCAA College Cup tournament. They will host the Furman Paladins on November 20 at 5:30 p.m. at West Campus Field — the fourth time the school has ever hosted an opening round match. The announcement comes days after it was revealed the university’s soccer programs will soon be playing in a new home courtesy of a $1.5 million gift from BBVA Compass. It will be the team’s eighth ever appearance in the tournament. The Paladins (12-5-3) earned an automatic bid by virtue of winning the Southern conference outright last week against Mercer. It will mark the team’s seventh postseason appearance, with Thursday’s meeting being the sixth time Furman and UAB have ever met on the pitch. The Blazers hold a 3-2-0 lead in the series. The last victory taking place the last time the two teams met — for a first round NCAA College Cup match in 2001. The winner advances to play Washington (12-5-1) on Sunday in Seattle at 5 p.m. PT. This year’s College Cup semifinal and final matches will be held in Cary, NC on December 12-14, 2014 at WakeMed Soccer Park — the fourth time it will be held there since 2005. Photo: via UAB Athletics website.